Serving the greater Kansas City, Missouri Area, including Overland Park, Leawood, Shawnee, Olathe, Lenexa, Topeka, Wichita, Lawrence, Parkville, Lee’s Summit, Blue Springs, Liberty, Columbia, Westwood, Fairway, Prairie Village, Roeland Park, Mission, Mission Hills, Pawnee, Pettis, Fox, Choteau, Kaw, Gallatin, Liberty, Riverside, Country Club/Waldo, Gladstone, Pleasant Valley, Midtown/Plaza, Line Creek Valley, Brooking, Briarcliff/Winwood, Blue, Independence, Raytown, Truman Plaza, Stadium/Park East, Riverfront Industrial, Swope, Argentine, Bethel Welborn, Kensington, Liberty Township, Riverview, Turner and the entire surrounding area. Celebrity Greens Kansas City is the Authorized Partner, Designer and Installer of Artificial Grass Lawns, Playgrounds and Putting Greens for the greater Kansas City, Missouri area. Celebrity Greens Kansas City only installs Artificial Grass products that are top quality, performance driven and environmental-friendly. Celebrity Greens Kansas City specializes in synthetic turf personal and commercial Golf Greens, Playgrounds, Sports Fields, Pet Turf and Artificial Grass Landscaping for all your synthetic turf needs. Just think: you’ll never have to water, fertilize or mow your lawn again! Synthetic Turf dramatically reduces the need for maintenance in your backyard and eliminates the need for water. It also eliminates the need for harmful chemicals that leach into the soil (fertilizers, pesticides, weed kill, etc.). Our artificial grass turf is the most realistic and durable turf you’ll find anywhere. 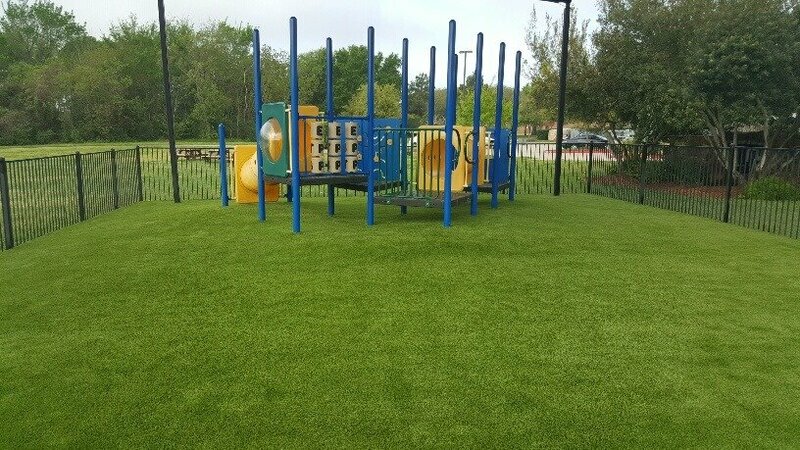 Optional, specialized padding under the turf makes for the perfect playground surface for your back yard play area or for a high traffic commercial application. Artificial grass is the perfect choice for a rough and tumble, heavy traffic area because it will always look great, add to kids safety with the underlayer padding, and never get muddy. We specialize in unique, professional grade putting greens, designed to maximize the use and beauty of your backyard or commercial space. Contact us today at 816-886-8624 for a free consultation!